Terry Pratchett has earned a place in the hearts of readers the world over with his bestselling Discworld series -- but in recent years he has become equally well-known and respected as an outspoken campaigner for causes including Alzheimer's research and animal rights. A Slip of the Keyboard brings together for the first time the finest examples of Pratchett's non fiction writing, both serious and surreal: from musings on mushrooms to what it means to be a writer (and why banana daiquiris are so important); from memories of Granny Pratchett to speculation about Gandalf's love life, and passionate defences of the causes dear to him. 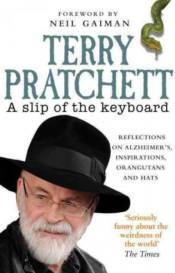 With all the humour and humanity that have made his novels so enduringly popular, this collection brings Pratchett out from behind the scenes of the Discworld to speak for himself - man and boy, bibliophile and computer geek, champion of hats, orang-utans and Dignity in Dying.